High-quality designs from Holland! Perfect for decorating your snailmail! But also for card making and scrapbooking use! 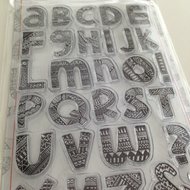 It allows you to print, pattern and colour over and over again! Simply apply ink, check your positioning & press firmly onto your project. Colour and embellish for maximum effect.